Is a revolver range stand (see below) a handy thing to have or simply a PITA? Found a nice one that claims to be compatible with my revolver and it seems like a really neat idea to organise loading and keep the revolver off the bench (and easily leave it with the cylinder open to show safe and unloaded). 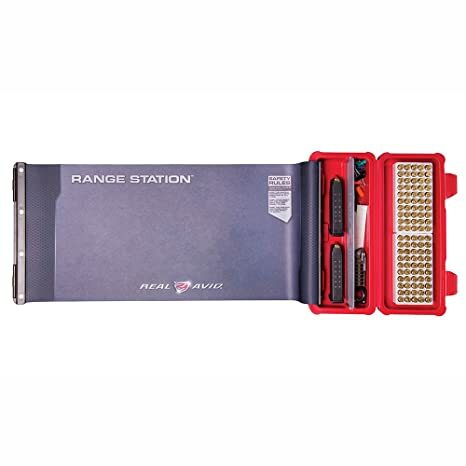 Assuming not having a bullseye type pistol box, any similar products of other range bench products for revolvers and pistols anyone might recommend? Maybe the Real Avid Range Station? I'm thinking with this and a revolver range block it could serve for pistols and revolvers. Those were what I was looking at. Useful? Gimmick? Is the stand good/safe/undamaging for the gun? Maybe get some kind of pistol stand. If I have the mat I'm less concerned about the guns being on the bench surface. But for the revolver propping the cylinder open is still a pain. Tried using the red unloaded indicator disk that came with the revolver and closing the cylinder, but range officer didn't like that. You really don't need any of that to shoot revolver. I bought a speed tray and speed loaders for my .22 and 38 and don't bother bringing them anymore. A long chamber flag inserted into the barrel will hold the cylinder open. A bowl full of bullets that are loose and easy to grab two at a time will make it possible/easy to keep up with any commands. The 45 is super easy because I just bring enough full moon clips to shoot the whole match. Safariland makes a speed loader tray which holds 14, 6 shot patterns or 84 rds. With two of these and four speedloaders one is good for 192 rds of shooting without handling loose ammo. Of course the same could be done with 32 speedloaders. Available in k frame or L frame. I cut rectangular pieces of cardboard to slip over the trays in transport, so rounds will not jiggle out. LenV wrote: You really don't need any of that to shoot revolver. I bought a speed tray and speed loaders for my .22 and 38 and don't bother bringing them anymore. A long chamber flag inserted into the barrel will hold the cylinder open. A bowl full of bullets that are loose and easy to grab two at a time will make it possible/easy to keep up with any commands. The 45 is super easy because I just bring enough full moon clips to shoot the whole match. Agree. When calling the line, I always allow extra time for the revolver folks. There is no reason to rush the "load" command; safety first. With some practice you get adept at picking up two cartridges at a time and loading them both in to the cylinder. I tried the speed loader route when I shot revolver in the 900, but with a Colt it was a tight fit and awkward. I was faster just loading them two at a time. I will never understand why the 10 seconds it takes me to load a K38 with 5 is a big deal. Actually when I have a block prepared ahead of time I loaded them in 8 seconds. One at a time.